While you can cook meat in Chica de Gallo's salsa without any additions, we made these chicken legs in a tomato-based concoction. It almost tastes like barbecue sauce and, well, chicken. The legs are served on top of veggies and rice, but you can eat them on their own or get creative. Preheat oven to 375*F. Combine Chica de Gallo Medium Salsa Fresca, 1/4 cup olive oil, tomato paste, and Worcestershire sauce in a bowl. Heat an ovenproof skillet with 2 tbps olive oil on medium-high. Add chicken and sear on both sides until golden brown (6-8 minutes). Cover chicken with sauce and bake for 25-30 min or until internal temperature is 165*F.
With winter here, it's time for something on the heartier side. Pan seared ravioli will fill your belly and warm you up in no time. You will get a healthy dose of vitamin C with the mango-sweet potato sauce. Wash, peel, and cube sweet potato. Cover in water and boil in saucepan for 20 minutes or until soft. Drain sweet potatoes and put in blender. Add mango pineapple salsa, milk, olive oil, and brown sugar to blender. Pulse until thoroughly blended. Serve hot. Cover and refrigerate leftovers for up to a week. Cook ravioli according to your favorite recipe or package instructions (We used butternut squash triangoli in the above picture and it was delicious). Drain ravioli very well. In a heavy pan, melt 1 tbsp butter. Heat drained ravioli for 3 minutes on each side or until browned. Serve with mango-sweet potato sauce and garnish with mango pineapple salsa. 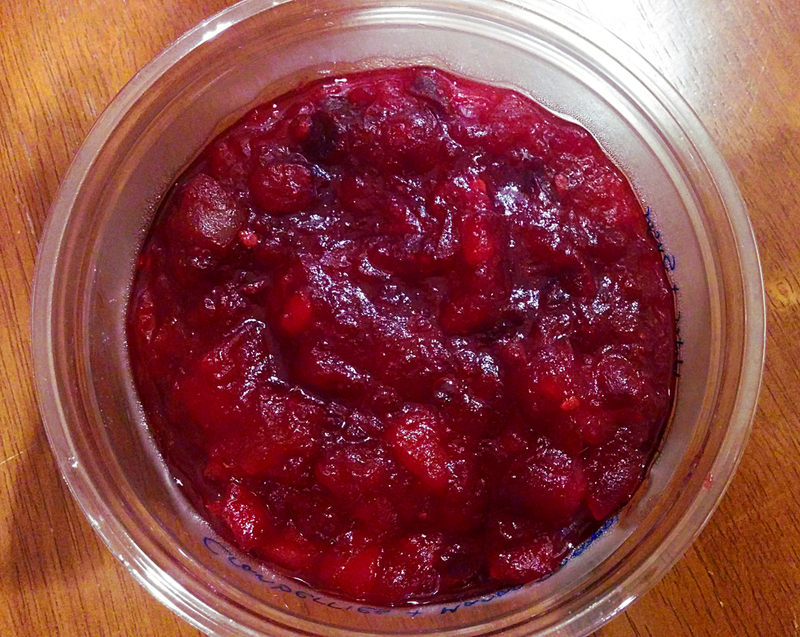 Cranberry sauce is a holiday staple, which means it can be a bit boring. Transform your traditional cranberry sauce with Chica de Gallo's Mango Pineapple Salsa. The result is a sweet and savory cranberry chutney perfect for topping the holiday turkey (or Tofurkey) and spreading on the day-after sandwiches. Rinse cranberries and remove stems. Combine all ingredients in saucepan. Bring to a boil and then simmer for 10 - 15 minutes or until all cranberries have popped and sauce has thickened. Cool before serving and refrigerate any leftovers. The flavors and heat of Chica de Gallo's salsas play well with Thai cuisine. The fresh cilantro and lime juice brighten up a traditional peanut sauce. Use this sauce on the protein of your choice. Great for dipping, too! Combine all ingredients in a blender. Refrigerate unused portion.